One hope scientists have is that string theory will explain some of the unusual results in quantum physics or, at the least, reconcile it with general relativity. Quantum physics traces its roots back to 1900, when German physicist Max Planck proposed a solution to a thermodynamics problem — a problem having to do with heat. He resolved the problem by introducing a mathematical trick — if he assumed that energy was bundled in discrete packets, or quanta, the problem went away. (It proved to be brilliant because it worked.) In the process of doing this, Planck used a quantity known as Planck’s constant, which has proved essential to quantum physics — and string theory. Planck used this quantum concept — the concept that many physical quantities come in discrete units — to solve a problem in physics, but even Planck himself assumed that this was just a clever mathematical process to remove the infinity. It would take five years for Albert Einstein to continue the quantum revolution in physics. The blackbody radiation problem, which Planck was trying to solve, is a basic thermodynamics problem where you have an object that is so hot that it glows inside. A small hole allows the light to escape, and it can be studied. The problem is that in the 1800s, experiments and theories in this area didn’t match up. A hot object radiates heat in the form of light (hot coals in a fire or the metal rings on electric stoves are both good examples of this). If this object were open inside, like an oven or a metal box, the heat would bounce around inside. This sort of object was called a blackbody — because the object itself doesn’t reflect light, only radiates heat — and throughout the 1800s, various theoretical work in thermodynamics had examined the way heat behaved inside a blackbody. Now assume that there’s a small opening — like a window — in the oven, through which light can escape. Studying this light reveals information about the heat energy within the blackbody. Essentially, the heat inside a blackbody took the form of electromagnetic waves, and because the oven is metal, they’re standing waves, with nodes where they meet the side of the oven. This fact — along with an understanding of electromagnetics and thermodynamics — can be used to calculate the relationship between light’s intensity (or brightness) and wavelength. The result is that as the wavelength of light gets very small (the ultraviolet range of electromagnetic energy), the intensity is supposed to increase dramatically, approaching infinity. In nature, scientists never actually observe infinities, and this was no exception. 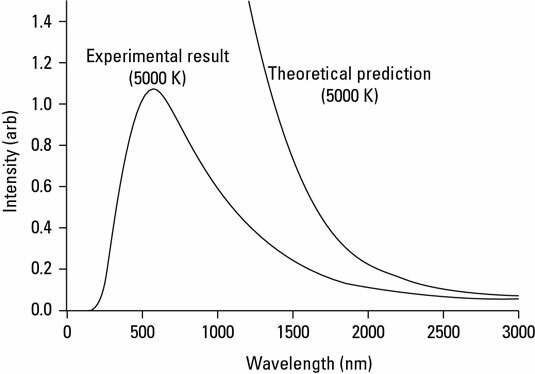 The research showed that there were maximum intensities in the ultraviolet range, which completely contradicted the theoretical expectations, as shown in this figure. This discrepancy came to be known as the ultraviolet catastrophe. The ultraviolet catastrophe threatened to undermine the theories of electromagnetics and/or thermodynamics. Clearly, if they didn’t match experiment, then one or both of the theories contained errors. When Planck resolved the ultraviolet catastrophe in 1900, he did so by introducing the idea that the atom could only absorb or emit light in quanta (or discrete bundles of energy). One implication of this radical assumption was that there would be less radiation emitted at higher energies. By introducing the idea of discrete energy packets — by quantizing energy — Planck produced a solution that resolved the situation without having to dramatically revise the existing theories (at least at that time). Planck’s insight came when he looked at the data and tried to figure out what was going on. Clearly, the long wavelength predictions were close to matching with experiment, but the short wavelength light was not. The theory was over-predicting the amount of light that would be produced at short wavelengths, so he needed a way to limit this short wavelength. Knowing some things about waves, Planck knew that the wavelength and frequency were inversely related. So if you’re talking about waves with short wavelength, you’re also talking about waves with high frequency. All he had to do was find a way to lower the amount of radiation at high frequencies. Planck reworked the equations, assuming that the atoms could only emit or absorb energy in finite quantities. The energy and frequency were related by a proportion called Planck’s constant. Physicists use the variable h to represent Planck’s constant in his resulting physics equations. The resulting equation worked to explain the experimental results of blackbody radiation. Planck, and apparently everyone else, thought this was just a mathematical sleight of hand that had resolved the problem in one strange, special case. Little did anyone realize that Planck had just laid the foundation for the strangest scientific discoveries in the history of the world.